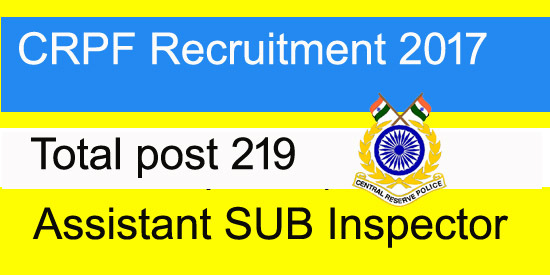 Central Reserve Police Rorce (CRPF) Online application for 219 posts Stenographer Assistant Sub Inspector for the year 2016 - 2017. Online application will be start from 27.03.2017 and will be close on 25.04.2017. CRPF bharti is only available online at official website www.crpfindia.com. Beware of fake website or fake applications. Candidates are advised to visit regularly to the website to download their admit card and exam schedule. Pay Scale :- Candidates will get pay scale 29,200 to 92,300. Educational Qualification :- For joining CRPF bharti 2017, Candidates must have passed 12th class or equivalent examination from the recognized board. Skill test :- 10 minutes @ 80 words per minute and 50 minute in English or 65 minute in Hindi on computer. Age limit : 18 to 25 years, uper age limit is 5 years for SC/ST candidates and 3 years for OBC candidates. How to apply :- visit official website www.crpfindia.com” and apply online. Examination fees :- Candidates who are belong to General category and OBC deposit Rs 100/ rupees as examination fees throw SBI bank challan only.